Susan Heim on Parenting: Make Sure Your Child’s School Lunch Includes O.N.E. Kids Coconut Water! Make Sure Your Child’s School Lunch Includes O.N.E. Kids Coconut Water! We worry a lot about sending healthy foods in our kids’ school lunches, but what about the drinks? If your children’s lunch box typically includes a soda or a standard popular juice box, they’re getting a lot of sugar and calories. Now, if your kids are like mine, they don’t get excited about plain water, so what’s a better alternative? O.N.E. Kids Coconut Water! O.N.E. Kids is made with real fruit juice mixed with 100% all-natural, USDA-certified coconut water. Coconut water contains essential electrolytes for hydration, as well as more potassium than a banana! And look how O.N.E. Kids compares with two leading brands in terms of calories and sugar. Big difference! And O.N.E. 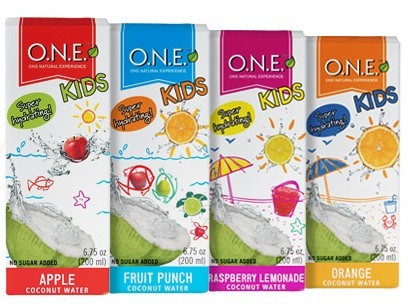 Kids comes in four delicious flavors: Raspberry Lemonade, Apple, Fruit Punch, and Orange. But will kids drink it? I have four empty O.N.E. Kids drink boxes on my desk to show that my kids loved them. When I asked Austen how they tasted, he told me, “Well, they taste a little different [from other juice boxes], but I like them!” The boys drained every box, but their favorite flavor was Orange. When you’re picking up drinks for your children’s school lunches this year, I hope you’ll get some O.N.E. Kids. Their products are available at major grocery retailers like Kroger, Publix, Albertson’s, Safeway, Whole Foods, Meijer, and many other places! Check them out online through the links below. DISCLOSURE: Product samples were provided for this review, but no financial compensation was received.